This is a superb primer on nutritional minerals for laypeople. The contributors to the book, Drs. De, Gliederer, Jose and Ms. Stephenson-Laws do a wonderful service in explaining the importance of nutritional minerals for human health and longevity. 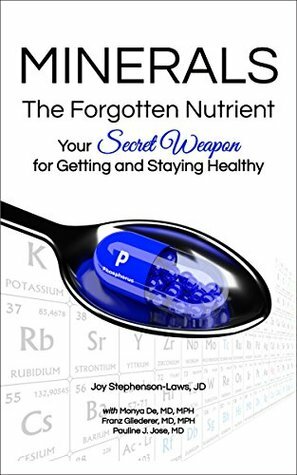 This is a well written and researched introduction to a neglected area of nutrition, minerals, backed by many years of clinical experience and medical research. The information is well-supported, with all of the supporting studies cited in the book. And is it well presented, never beyond the average layperson's understanding. The authors cover the role of minerals in all major aspects of human health - cardiovascular, mental and emotional and many other areas. A really great book for the person who wants to know more and take control of his/her health. This is a timely entry into the modern healthy nutrition movement. Sign into Goodreads to see if any of your friends have read Minerals - The Forgotten Nutrient.